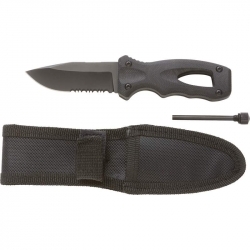 MOSSBERG(TM) Survival Knife with aluminum handle with 7-3/4' blade. Contains a mini storage compartment on the end of the handle. Handle includes: high quality compass, band aid, tweezers, safety pin, razor blade, fishing line, pencil, thread and needle. Glass-filled nylon sheath, glass-filled nylon cap, fire starter stick, slingshot tubing. 7' skeletal frame knife with a 1-1/2' blade, black paracord, black belt loop webbing with snap buckle. 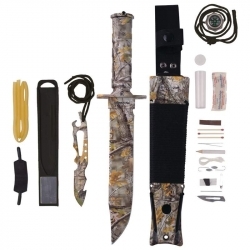 Camo finish on both knives and sheath. Feature grooved inserts for maximum gripping power, center wheel focus, soft rubber eye cups, neck strap, attached lens covers, and lens cleaning cloth. The carrying case has an adjustable strap. 12X power and huge 60mm front lenses. Barrels measure 7' (7-1/4' including eye cups). Limited 10 year warranty. Gift boxed. 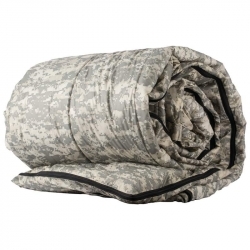 Digital Camo Queen Size Sleeping Bag with a matching, extra-large 600d polyester draw sting carry bag. Polyester shell, solid color polyester lining, micro polyester fiber fill. Zipper features extra-large pulls. Features polyester construction, fiberglass poles, 8 stakes, 4 nylon tie-downs, water-resistant, and drawstring storage bag. Measures 102-3/8' x 94-1/2' x 59-1/8'. When the shot hits but doesn't down your game, it's often necessary to track the animal. The easiest way to do this is with the blood trail, but if it's early dawn or dusk, that trail is hard to see. MeyerCo engineering developed the Meyerco(R) Bullet-Shaped LED Multi-Purpose Tracking Light specifically to be your eyes in the dark. Compact and powerful, this tracking light features 1 blue/violet LED for tracking blood, 1 green LED, 1 white LED, and on/off button. Requires 3 AAA batteries (not included). Measures 1' x 6-1/4'. Limited 1 year warranty. Clamshell. Molding after high-frequency heat pressing in flocking PVC materials and with valve gas nozzle, making it double protected from gas leak and permeability. Fashion and comfortable for you to use. Quick to inflate and quick deflate. Easy to carry when traveling. 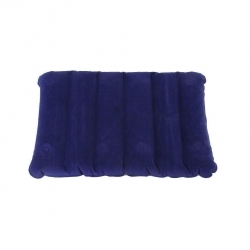 Ideal for outdoor Camping, indoor nap. Care: Hand wash and air dry, do not twist. 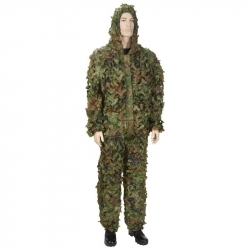 Blend into your woodland surroundings with the best camouflage ghilli suit on the market. 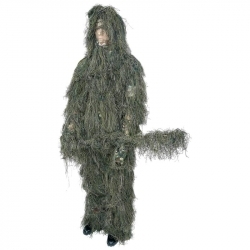 The Classic Safari(TM) 4pc Woodland Ghillie Suit includes jacket, pants, removable hood, and rifle wrap. 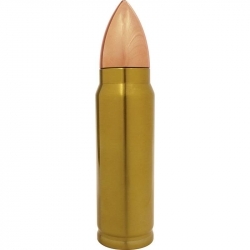 Features fire-retardant camouflage fibers; lightweight, breathable interior lining; and mildew-resistant materials. The Meyerco(R) Fixed Blade Knife with Fire Starter is a must for your camping gear bag. This fixed blade knife will cut kindling with ease, and the included fire starter quickly starts a camp fire. Powerful features include a non-glare, half-serrated 420 stainless steel clip point blade, a G-10 handle, and a nylon sheath. Measures 6-1/4' overall. Limited forever warranty. Clamshell. 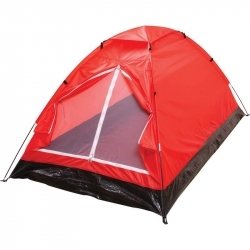 Features polyurethane coating, fiberglass poles, waterproof, water-resistant, zippered fine mesh door, metal connectors, metal tent stakes, detachable rain fly, and drawstring carrying bag. Measures 39-1/2" wide, 87" long, and 50" center height. Set includes: storage bag, jacket and pants. 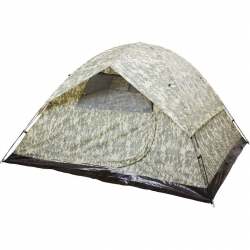 Features Invisible(R) camouflage pattern, lightweight breathable interior lining and mildew-resistant materials. 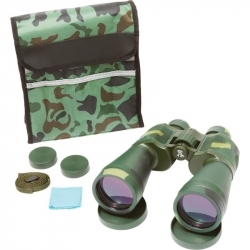 View events, wildlife and even outer space with these military-strength zoom binoculars that magnify up to 125 times! This is more powerful than many student telescopes! Feature large objective lenses for increased light transmission, ultra-quick zoom, grooved inserts for maximum gripping power, center wheel focus, lens cloth, soft rubber eye cups, neck strap, tripod attachment, and soft-sided carrying case with adjustable strap. Barrels measure 11-3/8'. Limited 50 year warranty. Black box. Never be without the Maxam(TM) 10'x12' All-Purpose Tarp, a versatile tool that's ready to assist and protect in any situation. Features rope reinforced hems, water-, weather- and UV-resistant silver exterior, and tear-resistant, mildew-resistant interior/exterior lamination. Hemmed Size 9'4" x 11'6". Use as an added floor for your camping tent, or protect the jet ski sitting next to the garage, or keep the wood pile at the cabin dry...the Maxam(TM) 12' x 16' All-Purpose Tarp has you covered. Features rope reinforced hems, water-weather-and UV-resistant silver exterior, tear-resistant, mildew-resistant interior/exterior lamination. Hemmed size 11'4' x 15'6'. Never be without the Maxam(TM) 50' x 50' All-Purpose Tarp, a versatile tool that's ready to assist and protect in any situation. 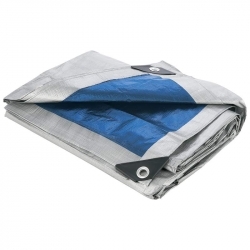 Features rope reinforced hems, water-, weather- and UV-resistant silver exterior, and tear-resistant, mildew-resistant interior/exterior lamination. Hemmed Size 48'3" x 49'6". 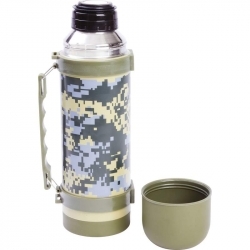 Designed in cool digital camo, this versatile bottle is perfect for a campout in the woods or a day spent foraging the concrete jungle. 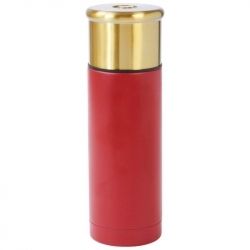 Features matching green handle and drinking cap; stainless steel interior and exterior construction; and one-touch stopper. Measures 11-1/2' tall, 3-3/4' in diameter. Limited lifetime warranty. White box. Long, cold winter days are brightened by the comfort of a piping hot bowl of soup. 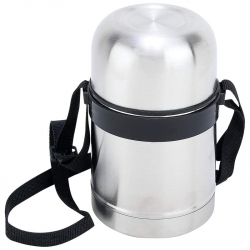 You can take that invigorating warmth with you on the go with the portable vacuum soup container. It's also great storage for a variety of hot and cold items. 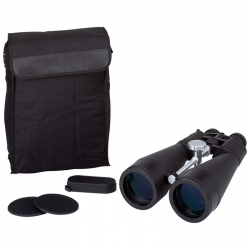 Features polished exterior, screw-on black cap, screw-on dome lid, and carrying strap. Limited lifetime warranty. White box. 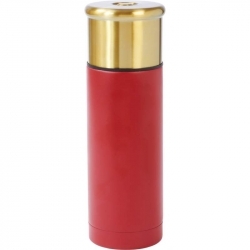 Take your favorite hot or cold drink on the go with the Wild Shot(TM) Bullet Vacuum Bottle. Superior vacuum construction will keep beverages hot or cold for hours. 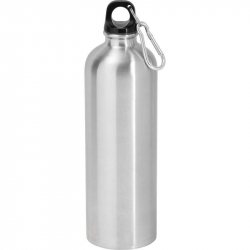 Holds 16.9 ounces (500 ml). Brass and copper finish. Gift box.